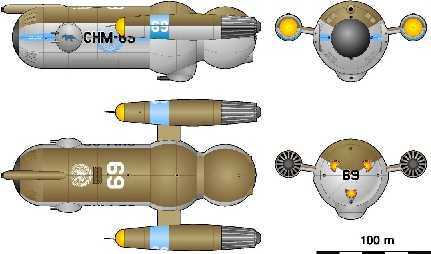 The Conqueror class was the ultimate Battle cruiser design to enter service during the war, it developed the Tannhauser design, reverting to an aft mounting for the warp drive. The ship carried the first ship to ship mounting of the Powerful ELC-2 Electron laser cannon that had previously been mounted in the Farragut class for ground assault use. The ships transferred to the new Starfleet in 2161, but were soon retired as although capable, the cost of operation of these powerful ships was to much for the peacetime Starfleet budget.